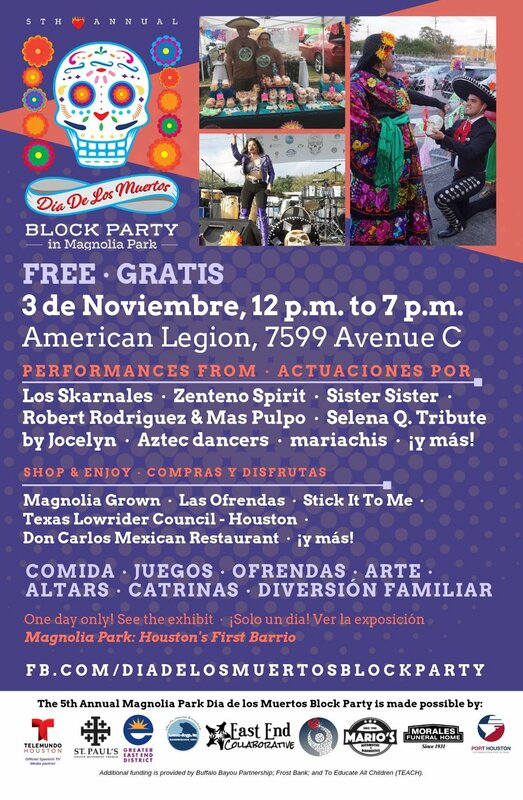 This annual block party in the historic Houston community of Magnolia Park honors the neighborhood’s cultural heritage by hosting a family-friendly celebration all can enjoy for FREE, highlighting the holiday of Dia De Los Muertos and its traditions. In it's fifth year, the party is going to be bigger and better than ever--you don't want to miss this exciting event! ▶ FOR SPONSORSHIP INQUIRIES, email diadelosmuertosblockparty@gmail.com. Concessions available for sale by cash or card, and services for concessions offered in English and Spanish. Block party area is accessible to people with limited mobility.